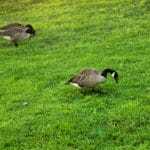 Brief Description: 1-2 inch circular patches of dead grass that may grow to form rings or crescents 3-12 inches in diameter, often with a yellow or bronze-colored outer rim. Sometimes forms a “frog eye” pattern when a clump of a resistant grass type is growing in the middle of a crescent or ring. 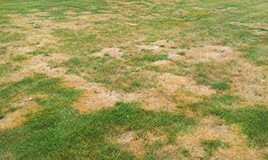 Summer Patch is a root-destroying fungus, which helps to differentiate this lawn disease from diseases that it imitates, such as Dollar Spot and Necrotic Ring Spot. Unfortunately, it is also worse for your lawn, because as the roots of the grass die, so too does the grass. Reseeding is often necessary after summer patch infestations. This lawn disease thrives in sunny, hot lawns and appears most readily in short grass. Summer Patch is most likely to be seen in weather of 90 degrees or higher. Summer patch mainly grows in rings and crescents which sometimes join together to form more irregular shapes. But it can also grow in long streaks. You can tell that your dead patches are Summer Patch and not Dollar Spot or Necrotic Ring Spot by pulling up a tuft of grass and examining the roots. 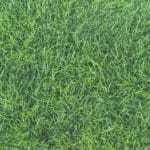 Summer Patch turns the roots of affected grass types dark brown or black and causes them to rot away, while healthy grass roots are light colored and long. If your grass is long enough, you may have Summer Patch on your lawn and not know it because the long blades are hiding the dying roots. Luckily this is less common as overly short grass is one of the main causes of Summer Patch, and is much more commonly seen in closely mown lawns. 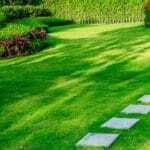 Summer Patch can be prevented by avoiding cutting more than 2/3 the length of your grass. Cutting that much length from a lawn that has been left to grow long is known as “scalping” the grass, and is the cultural practice most closely associated with the occurrence of Summer Patch because it weakens the grass and makes it more prone to infection. 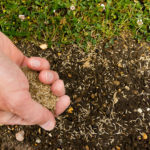 You should also avoid adding nitrogen-based fertilizer to the soil in summer, and avoid watering lightly and frequently in hot weather, as this dampens the shallow areas where Magnaporthe poae often resides and triggers its development. It is also important to aerate the soil to prevent the buildup of thatch and promote better drainage. Because Summer Patch may damage lawns quickly, fungicides are often used to control them.